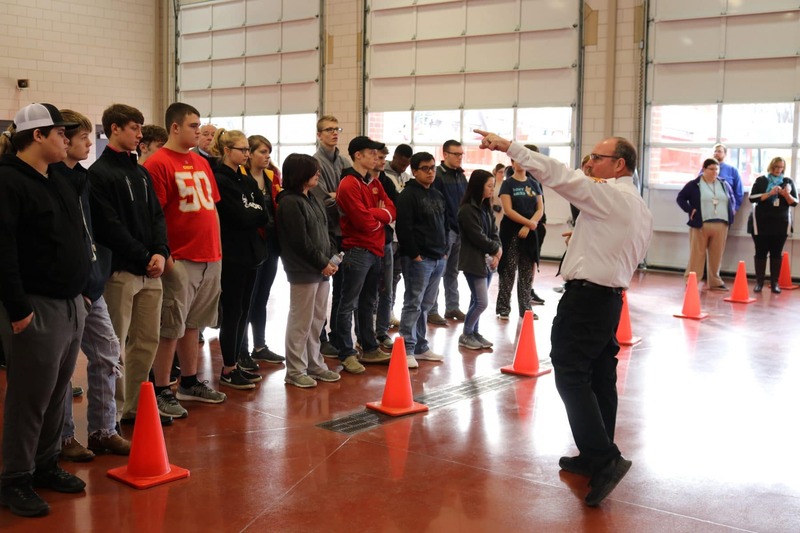 PITTSBURG, KS – Local high school students got a glimpse at what it’s like be a firefighter on Thursday, January 24, during the Fire Science Open House at Pittsburg Fire Station No. 1. The open house kicked off a new fire science program offered through a partnership between Coffeyville Community College, the City of Pittsburg and several southeast Kansas high schools, and initiated by Greenbush – The Southeast Kansas Education Service Center. For many students, this event was their first introduction to a career as a firefighter. Around 40 students attended the open house and now have an opportunity to enroll in the new fire science program starting in the fall of 2019. Courses will be taught at Pittsburg Fire Station No. 1 and Pittsburg firefighters will serve as the instructors. With curriculum being offered through Coffeyville Community College, students can earn dual high school and college credit toward an associate’s degree – giving them a head start on the career path of becoming a firefighter. Courses are open to high school students throughout the region. The purpose of the program is to give students exposure to job opportunities and help meet the growing demand for first responders. Pittsburg Fire Chief Mike Simons says he hopes the program will inspire students to consider becoming a firefighter.